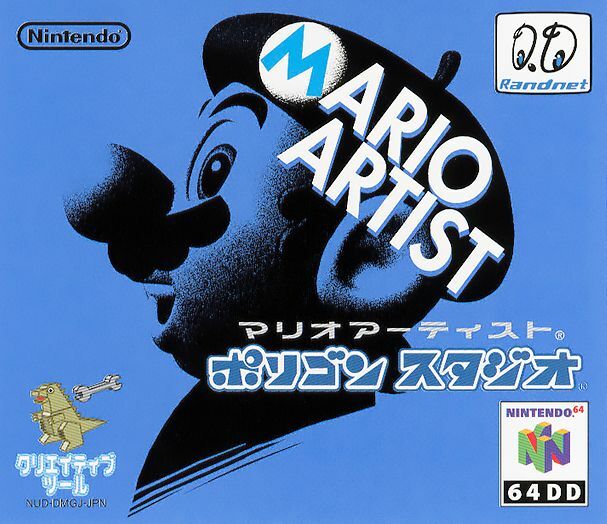 Mario Artist: Polygon Studio is the fourth and final game released in the Mario Artist series, released in Japan only for the Nintendo 64DD on August 29, 2000. There were four more planned, but due to the failure of the system they remain unreleased. The game allows players to construct and render 3D polygons, then texture them, and paint them. The player can also assemble models from pre-made or player-made parts and use them to explore a 3D world called the Experimental World and find newer, more effective parts. Along with this, two minigames are included: Sound Bomber, a simple predecessor to the WarioWare series, and Go Go Park, in which the player "winds up" their model and tries to get them to stop at a certain distance before a cliff, serving as a predecessor to the minigame Chicken Race in WarioWare, Inc.: Mega Microgame$!. Both minigames have three tiers of difficulty. Editing a face polygon in Mario Artist: Polygon Studio. Mario Paint: The "baby face" from this game can be seen floating in the background of the model creation menu, and will make its signature noise when clicked on. As with all other Mario Artist titles, a dog's head serves as the "Undo" icon, a reference to Undodog. When starting up the game, there's a chance that a scene of two figures doing aerobics will play, just like in this game. The Baker brothers leaving behind messages for the player in the Experimental World are eventually revealed to be these same two figures, and they can both be collected and used as blocks by the player. Super Mario 64: Untextured versions of Mario and Yoshi's models from this game can be loaded in the Polygon Editor. A part called the Power Star can be found in the Experimental World mode, which makes all Power Block parts perform like their most superior counterparts. JUMP appears as Crazy Cars. BLOCK appears as Diamond Dig. ROULETTE appears as Wario Whirled. BASEBALL appears as Batter Up. FLIES appears as Mario Paint: Fly Swatter. RACE appears as Hectic Highway and Racing 112. MAZE appears as Maze Daze.